Annalee Doll Description: Last one. 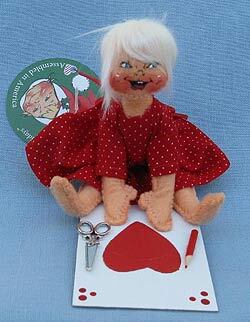 Open eyes, open mouth - as shown, blonde hair, red dress with white dots, sitting making a Valentine with scissors and pencil. Comes with Assembled in America numbered tag and the first name of the designer that dressed her. Hand assembled in Annalee headquarters in Meredith, NH.